Scientists have made significant progress in the design of vital components used in hydrogen fuel cell vehicles. Improved features will lower production costs and help create a clean automotive future. With hybrid and all-electric battery-powered cars now becoming mainstream, hydrogen's importance as a versatile, clean and safe energy carrier is increasingly recognised. Although its use in transport is gaining momentum, the current market share of fuel cell electric vehicles (FCEVs) is small due to high costs and efficiency problems. A group of experts is addressing this challenge as part of the EU-funded INN-BALANCE project. They have recently specified the interfaces between the crucial components of the FCEV technology to improve their design. As stated in a press release on the project website, "important milestones have been reached regarding the definition of interfaces between components and the fuel cell stack as well as the design of the stack housing and the anode, cathode and the cooling modules." These components are referred to as auxiliary components, or 'balance of plant' (BoP). They regulate the fuel cell system and manage the supply of hydrogen and air to the stack. "INN-BALANCE seeks to engineer various improvements at the BoP level with a special focus on manufacturing-oriented design. The aim is to lower the costs for the industrial production of fuel cell systems." Quoted in the same press release, Jörg Weiss-Ungethüm from the German Aerospace Center, who is in charge of developing the cooling system, said the cooling module is used for the thermal management of the stack. This has a significant impact on the water management and is critical in terms of performance. In addition, the BoP components have to be kept at "optimal temperature and heat has to be supplied to the passenger cabin as needed." The ongoing INN-BALANCE (INNovative Cost Improvements for BALANCE of Plant Components of Automotive PEMFC Systems) project also proposes an "integrated injector/ejector solution." This will maximise the power output from the stack while minimising hydrogen losses. PEMFC stands for proton exchange membrane (PEM) fuel cell, also called polymer electrolyte membrane fuel cell. It's a type of acid-based fuel cell that uses the transport of protons from the anode to the cathode through a solid PEM. These fuel cells run at temperatures below 100 °C. Anode and cathode are the two electrodes in a battery or fuel cell, where the former is positively charged and the latter is negatively charged during electricity generation. Most fuel cells designed for use in vehicles produce less than 1.16 volts of electricity – far from enough to power a vehicle. Therefore, multiple cells must be assembled in a fuel cell stack. 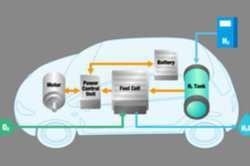 In an FCEV, electrical energy that powers the electric motor to propel the vehicle is supplied through a chemical reaction that takes place between hydrogen and oxygen in the fuel cell. Converting hydrogen gas into electricity produces only water and heat as a by-product. If the hydrogen is being generated by a sustainable source, this means fuel cell vehicles could provide zero-emission transportation opportunities. INN-BALANCE was set up to develop a novel and integrated platform for developing advanced BoP components in current fuel cell-based vehicles. This is aimed at improving their efficiency and reliability, reducing costs, and presenting a stable supply chain to the European car manufacturers and system integrators.